If you have any problems in relation to cracking please phone us on free phone 0800 298 5424 for a friendly chat. We are experienced, professional independent building Surveyors who are knowledgeable in carrying out structural surveys on all types, styles and eras of buildings. If you are moving house or having any property issues then an independent Surveyor can help provide a comprehensive survey report on a building whether that be residential or commercial. 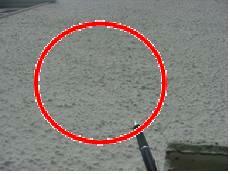 What do the circles and ovals mean in our building surveys on our photos and sketches? In our building surveys and structural surveys the circles and ovals are a scheme that we use to highlight property problem areas so that you are not left wondering what the property problem is. In addition to this if the survey photographs do not we believe explain the property problem enough together with our survey report we also add in one of our own survey sketches like this one shown to the right. Furthermore we would also like to introduce to you what we call our Good, Bad and Ugly survey which is a building survey, sometimes known as a structural survey, and is something that we have developed over many years, in fact several decades. We have listened to feedback from our clients and amended and altered our surveys to make them easy to read and describe issues clearly. The key factor we believe is that our surveys are easy to understand in plain English. We thought an example of a problem that we have come across would be a good way of showing you what we do as independent Surveyors and what cracks can mean. Recently whilst carrying out gardening work the householder noted that there was cracking in the property, which they had not seen before. Concerned about this, they therefore called us to give an independent assessment. We pride ourselves on our professional standard and easy to read reports which we have been carrying out for many years on every age, type and style of property across the UK. As independent Surveyors we are working for you with your interests at heart and will give precise and informative information regarding your property issue. Initially we carried out an external examination of the cracks, photographing the cracks and recording their position and sketching them. Whilst we were carrying out all this surveying work we were thinking about what the property problem could be. 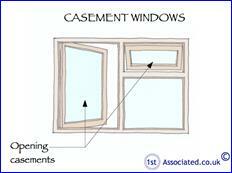 We carried out the same exercise internally and noted that the cracks were predominantly around the windows. 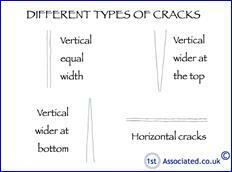 The cracks ranged from hairline cracks to cracks of a few millimetres wide. The action required is that we would recommend anyone with an older property to think carefully before having plastic windows installed. We then had a general chat with the homeowner and a specific one about the cracks and about the history of the property. This, combined with our general knowledge of 1920's properties, brought us to a conclusion, but before we give you that let us explain a bit more about the thought process. 1920's buildings or around the war year buildings had many characteristics, one of which is that there was a limited supply of tradesmen at the time and that materials were rationed. Defects in both are common and often houses were built in, what we would term as, a lightweight style, utilising the minimums due to the rationing that existed. Since that time there have also been major alterations and additions in most houses, the first relating to how the property is heated. 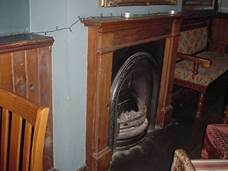 Originally in years gone by the heating would have been via coal fires so there were coal store houses, and also over the years central heating has been added to properties, which had meant that floorboards have needed to be lifted and cut into to run the pipes, etc. This means that construction that was already lightweight may in addition have been cut into, causing further problems. Also at the time the properties were constructed it was not standard to treat all timbers, accordingly woodworm is more prevalent in this age of construction. There are many other, what we would term as, characteristics of this age of construction that we could mention but we hope these examples give you an indication of the type of things that surveyors look for. 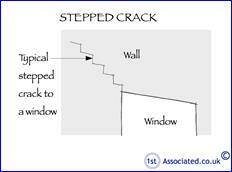 However, in this instance due to the way the cracking was being formed pointed to there being problems around the windows. This was confirmed when we did what we refer to as a property timeline. The timeline that we carry out, as independent Surveyors when we look for that specific defect is a history of as many alterations and amendments as the householder can advise us of. 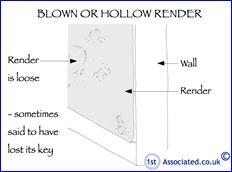 We then also add into the items that we have noted that may be the householder is not aware of or has forgotten about or that happened before they came to the property. This builds up a picture and a history of the property construction, so in this case we were very pleased when the householder advised that they had had the windows replaced about a year ago. The original timber windows had been replaced with plastic double glazed windows and whilst this had benefits on the thermal properties and acoustics, (as they had some noise issues too), they certainly did not help the structure. This is because the properties original timber windows (as we did check they were timber windows previously) also had structural properties, which meant in part they supported the structure. They were also flexible and moved with the structure as it moved throughout the year, because all properties of this age have some element of movement. These two factors meant that the building adjusted over the different seasons and therefore the cracking didn't occur. With the new plastic windows that are much more rigid the wall and the render couldn't move as much and therefore cracked and this is the hairline cracking that the owners was getting concerned about. In this case it was just surface cracking. We would recommend that the surface cracks are sealed with a filler that allows for movement (a hard filler would simply fall out sooner or later) and then redecorate. We also recommend that one of the cracks is opened up and the render hacked off, just to check that it doesn't carry on through the brickwork beneath. We recommend that should you decide to have a building survey with us you meet our qualified independent building surveyor at the property during the survey to discuss further any issues such as cracking that you have. This also gives us the opportunity to show you what we have found. Please free phone us on 0800 298 5424 for a friendly chat with one of our surveyors. 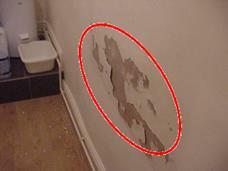 You may like to see some examples of Building Surveys we have carried out. You will see that our surveys contain photos, sketches and definitions that help to explain the specific problems that we find within the property. There is also an Executive Summary at the start of the survey report that highlights the main issues that we find with the property. Please call us and we can email you some of these examples.